The Dominators are weapons used by the MWPSB to subdue criminals. The Dominators can link to the Sibyl System and identify the individual whom they are pointed at, and can read the individual's Crime Coefficient. 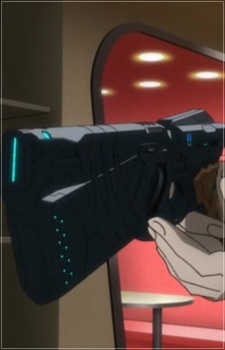 The individual's Crime Coefficient level determines the Dominator's firing mode, and the Dominator will change its shape depending on the mode. The modes available are Non-Lethal Paralyzer, used to stun the target, Lethal Eliminator, used to kill the target on site by causing the target to explode, and Destroy Decomposer, a mode used for heavily-armored targets. The Dominators can only be operated by authorized users and cannot be used against individuals with a low Crime Coefficient. If handled by an unauthorized user or aimed at an individual with a low Coefficient, the Dominator will lock its trigger.